Objective: The aim of this study was to evaluate the efficacy and safety of short stem and long stem hip arthroplasty. Design: A systemic review and meta-analysis. Data sources: Randomized Controlled Trials (RCTs) comparing short stem with long stem were derived from the databases (PubMed, Embese, Google, the Cochrane Central Register of Controlled Trials (CENTRAL) in the Cochrane Library and ISI Web of knowledge). Outcome measures: Primary end points were thigh pain, radiographs and the quality of life; and the secondary end point was the adverse events. Results: A total of 9 Randomized Controlled Trials (RCTs) were performed according to strict eligibility criteria. We enrolled 747 patients, with 364 patients randomized to short stem and 383 patients randomized to standard stem. Separate clinical and radiological outcome analyses were based on different follow-up periods. HHS (Harris Hip Scores) were significantly different in both of the two follow-ups (the short time: MD: 5.74, 95% CI 3.20 to 8.27 and the mid-long time: MD: 4.16, 95% CI 2.36 to 5.97). Significant differences were also observed in WOMAN scores (MD: 10.37, 95% CI 5.71 to 15.03), and pain scores (MD: 0.54, 95% CI 0.18 to 0.90). However, no differences were found in BMD (Bone mineral density) in the both of the two follow-ups (the short time: MD: -0.02, 95% CI -0.08 to 0.03 and the mid-long time: MD: -0.10, 95% CI -0.16 to -0.04), and in adverse complications (OR: 0.40, 95% CI 0.13 to 1.22). Conclusions: The use of short stem significantly reduced pain intensity. In the follow-ups, Harris Hip Scores and WOMAN Scores significantly increased. However, the BMD and complications remain unclear due to little evidence. Short stem hip arthroplasty, Long stem hip arthroplasty, Osteonecrosis, Clinical outcomes, Radiological outcomes, Meta-analysis. Osteonecrosis (ON) is a devastating disease that primarily affects weight-bearing joints. The hip is the most commonly affected joint. As a symptomatic disease, osteonecrosis of the femoral head is a serious public health issue. It is a major cause of pain and disability . Painful osteoarthritis of the hip can be successfully treated with Total Hip Arthroplasty (THA). It achieves excellent technical outcomes and provides significant benefits for pain, mobility, and physical function . Total Hip Arthroplasty (THA) is mostly adopted for the patients who failed to get pharmaceutical treatments and other non-surgical treatments. Although THA is one of the most successful procedures performed by orthopedic surgeons worldwide, current research and development continue to strive for improvement in the biologic and mechanical designs of modern total hip prostheses. Short-stemmed femoral implants are characterized by a metaphyseal osseointegration and strain distribution, which are thought to preserve more native host bone and optimize proximal load transfer utilized with the advent of less invasive surgery and rapid-recovery protocols, and which are increasingly regarded as implants of first choice in osteonecrosis, especially in young patients [3,4]. It remains unclear whether short stem total hip arthroplasty benefits more population, and long-term follow-up studies are still lacking. Therefore, we conducted this systematic review and meta-analysis to compare the efficacy and safety of short stem total hip arthroplasty versus long stem total hip arthroplasty. We performed a computerized literature search in PubMed, Embase, Medline, Web of Science, and Cochrane Library databases for relevant articles published up to April in 2016, using the Medical Subject Heading and keyword search terms: short stem, standard stem, long stem, femur head necrosis, aseptic necrosis of femur head, avascular necrosis of femur head, total hip replacement, hip arthroplasties replacement, hip prosthesis implantations. No restrictions were applied to the publication period of the articles. This search was supplemented with citation tracking of relevant review articles and prior meta-analyses. Language is not limited, and all searches were limited to human studies. We selected studies, considering the following pre-determined inclusion criteria: (1) all patients over 18 years of age, (2) ON as the primary indication for surgery, (3) THA as a primary procedure, (4) disease-specific and/or generic clinical and radiological data were recorded. These studies were restricted according to the following report characteristics: (1) original research only (2) patients with hip fracture, femoral neck deformity and rheumatoid arthritis were excluded. The data were independently abstracted by two reviewers (Chang-Lu Liu and Hui-Juan Nie). Agreement between the reviewers was evaluated by Kappa statistics. Disagreements were resolved through discussion, and a third reviewer (Xiao- Min Liu) was involved to achieve a consensus when necessary. The bias of the included studies was assessed according to the Cochrane group’s Cochrane Handbook for Systematic Reviews of Interventions . This study was performed in compliance with the quality of reporting of meta-analyses (PRISMA (Preferred Reporting Items for System reviews and Meta- Analyses) statement) . The primary end points were thigh pain, radiographs and the quality of life. The secondary end point was the adverse events. We performed separate analyses of clinical outcomes based on different follow-up periods. The time frames were defined to reflect short-term (in hospital for 6 months), medium and long-term (longer than 6 months) follow-ups, according to the different follow-up durations of the included studies. If both manual and mechanical devices were used in the same study, only the data pertaining to manual aspiration thrombectomy were extracted. A sub analysis of the special thrombectomy devices (Rescue and TVAC) was performed. For all of the clinical outcomes, intention-to-treat analysis was utilized. The meta-analysis was performed using RevMan software, version 5.3 (Cochrane Collaboration). Summary Risk Ratios (RRs) and their corresponding 95% Confidence Intervals (CIs) were computed for each dichotomous outcome, using fixed or random effects models. For outcomes with significant heterogeneity (Chi2 p, 0.05 or I2.50%), the random effects model is reported in the text and figures; for all of the other outcomes, the fixed effects models are reported. The random effects models were employed for sensitivity analysis when the fixed effects models produced positive results. We evaluated the level of evidence using the GRADE (Grades of Recommendation, Assessment, Development and Evaluation) approach . The GRADE pro software version 3.6 was used. We obtained our assessment by judging the designs of the studies, the risk of bias, inconsistency, and imprecision. 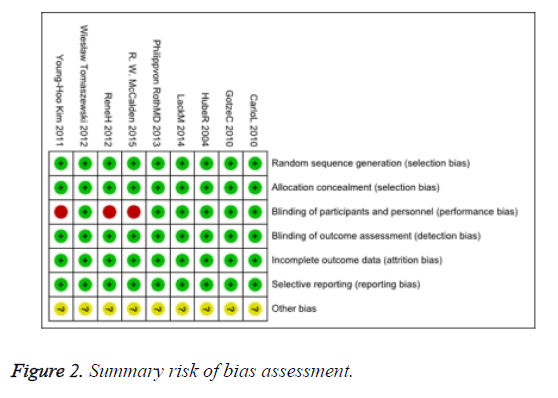 The risk of bias in individual studies was assessed by a qualitative review based on study quality and tabulated data. Risk of bias across studies was analysed by Tau2 and I2 statistic as well as funnel plots to assess publication bias. Outliers were annotated in the funnel plots. These analyses of risk of bias facilitate more accurate interpretation of the qualitative and quantitative findings of this review by allowing assessment of strength of evidence and effects of bias on the findings. Therefore a limited meta-analysis was performed with pooled results of six studies (mostly with a level of evidence II/III). Complete standardized response means without pooled analysis are shown in Figure 1. We searched 127 yielded studies, of which 35 duplicate studies were excluded and 48 studies were ruled out after reading the title and abstract for preliminary screening. We read through the full-text of the remaining 36 studies, and 27 studies among them were excluded since they did not meet the inclusion criteria. Finally, of the citations identified through electronic and hand searches, we included 9 trials published from 2004 to 2015 and enrolling a total of 747 participants (Figure 1). The characteristics of the nine included trials were presented in Table 1. Three of the trials have high risks of bias in studies (Figure 2). Figure 2. Summary risk of bias assessment. HHS (Harris hip scores): Three trials involving 152 participants contributed HHS of short time data for meta-analysis (Figure 3). The use of short stem in hip arthroplasty significantly improved in the short follow-up on the visual analogue scale (MD: 5.74 95% CI 3.20 to 8.27). Four trials involving 147 participants contributed HHS of mid-long term time data for meta-analysis (Figure 4), and also significantly improved (MD: 4.16 95% CI 2.32 to 5.97). Overall, the HHS of the short and mid-long terms has improved a lot. Figure 3. Short time data of Harris hip scores (HHS). Figure 4. Mid-long time data of Harris hip scores (HHS). WOMAN (Western Ontario and McMaster universities osteoarthritis): The WOMAN index, consisting of 32 questions concerning patients’ subjective evaluation and quality of life, was used. For each question, points were given and then summed up. The total score reflected a comprehensive evaluation of the patients’ quality of life. In our review, the outcome improved a lot (MD: 10.37 95% CI 5.71 to 15.03) (Figure 5). Figure 5. WOMAN (Western Ontario and McMaster Universities Osteoarthritis) score comprehensive evaluation. Pain score (numeric rating scale (NRS)): Evaluation with the NRS evaluates patients’ pain according to an 11-point (0 to 10) numeric scale, and it showed significant improvement between the two types (MD: 0.54 95% CI 0.18 to 0.90) (Figure 6). Figure 6. Pain score (Numeric rating scale (NRS)) comprehensive evaluation. BMD (bone mineral density): We observed no significant differences in BMD according to the two types of operations, of short time (MD: -0.02 95% CI -0.08 to 0.03), and mid-long time (MD: -0.10 95% CI -0.16 to -0.04) (Figures 7 and 8). Figure 7. Short time data of BMD (bone mineral density). Figure 8. Mid-long time data of BMD (bone mineral density). The adverse events including common complications such as dislocation infection, etc. provided no difference between the two types of operations (OR: 0.40 95% CI 0.13 to 1.22) (Figure 9). Figure 9. The adverse events including common complications. In our review, clinical and radiographic data are available to compare the two types. Short and mid-long term follow-ups were made. Theoretically, the benefits in long term use of the short stem femoral were significant. Clinical results and physical activity were assessed using the Harris Hip Scores (HHS), WOMAN, NRS; pre- and post-operative HHS scores also demonstrated a significantly better improvement after implanting short stem. Lombardi AV has approached the outcome in their study . With regard to postoperative pain and function scores, there were significant differences in the HHS, pain score and WOMAN score between the two groups, and the longest follow-up time was more than four year in our observation. We assessed loosening of the femoral component, stress shielding, and remodeling of the bone defect by comparing the immediate postoperative radiograph with the most recent radiograph. Radiographic evaluation of hip using Anteroposterior (AP) pelvis and lateral radiographs of the involved hip was taken at the same follow-up as the DEXA-scans, following a standard protocol. They were scored according to Enghs criteria for implant ingrowth . Radiological analysis showed no significant increase in femoral offset following short and long stem implantation. The BMD has little differences in our review, and the overall changes documented in this study reflect general trends that have been documented in the literature by other studies with short follow-up periods. Evaluating longitudinal changes in the BMD with DEXA in the different prosthetic designs can be problematic. Bone mineral density, as measured by this method , is defined as the bone mineral content divided by the area in the radiographic frontal plane of the targeted bone. Minor changes in femoral rotation or patient position can lead to a 5% precision error possibly by altering the area of the medial femoral cortex. We performed no inter observer variability studies on the measurement of the radiographs and on the BMD measurements, indicating excellent reproducibility. Without serial measurements, it is not possible to determine when these changes occurred and whether they would have been found to have stabilized on the longer term follow-up. We found no radiographic differences between the two types of operations according to bone type, alignment of the stem, cup and stem position and prevalence of radiolucent lines, the center of rotation, limb length, femoral neck length, and femoral offset. All hips had bone ingrowth into the femoral components, and no hip in either group required revision of any component for any reason. The hip pain decreases after the two stem hip arthroplasties, while it reduces operating time and provides different size options including long stem variants . As all surgery is linked to a certain percentage of failure in all disciplines, care must be taken to identify differences in complication rates between the established and the new operative therapy. As adverse events normally are seldom seen in THA, the differentiation process requires a limited number of events for the difference to become obvious or even significant. A high prevalence of thigh pain has been reported after cementless THA, which has been attributed to micro movement of the stem in the presence of a tightly fitted, distally rigid stem. The absence or low prevalence of thigh pain in the short stem group in our study may be attributed to the rigid axial and torsional stability of the stems in the absence of contact. This retrospective revision analysis of femoral complications is based on a high number of cases and a certain level of experience with short hip stems, which is indicated in one third of the primary THA performed at the authors’ institution. Since only the revision cases treated at the authors’ institution were included in this analysis, the total number of revisions may be larger. When we developed a new surgical method, it is mandatory to systematically analyse failures to speed the learning process and to confirm or revise indications, technique, and implants, so as to mitigate patient harm as much as possible. Short hip stems have been introduced in THA implantation with the aim to restore physiological biomechanics as much as possible and to ensure good longterm functioning for THA implantation. Our publications show that adequate stability can be achieved with the selection of a short stem when bone quality is good. To reduce the risk of a movement, Whiteside has shown that preserving short hip stems is primary and stable. The femoral neck can effectively reduce micromotion and increase torsional stability . In summary, the present meta-analysis suggested that the use of short stems could improve the HHS, Pain Score and WOMAN, in long-term clinical outcomes, but there was no evidence of successful benefit in BMD after short stem hip arthroplasty. Short hip stems have been introduced in THA implantation with the aim to restore physiological biomechanics as much as possible and to ensure good long-term functioning of the replaced joints as well as to preserve the proximal femoral bone tissue for potential THA re-implantation. This research was financially supported by the Natural Fund of Inner Mongolia, China (grant No. 2016MS08129). Cushnaghan J, Coggon D, Reading I, Croft P, Byng P, Cox K, Dieppe P, Cooper C. Long-term outcome following total hip arthroplasty: a controlled longitudinal study. Arthritis Rheum 2007; 57: 1375-1380. Smith GH, Johnson S, Ballantyne JA, Dunstan E, Brenkel IJ. Predictors of excellent early outcome after total hip arthroplasty. J Orthop Surg Res 2012; 7: 13. Ghera S, Pavan L. The DePuy proxima hip: a short stem for total hip arthroplasty. early experience and technical considerations. Hip Int 2009; 19: 215-220. Santori FS, Santori N. Mid-term results of a custom-made short proximal loading femoral component. J Bone Joint Surg Br 2010; 92: 1231-1237. Higgins JP, Altman DG, Gotzsche PC, Juni P, Moher D, Oxman AD, Savovic J, Schulz KF, Weeks L, Sterne JA, Cochrane Bias Methods G, Cochrane Statistical Methods G. The Cochrane collaborations tool for assessing risk of bias in randomised trials. BMJ 2011; 343: 5928. Guyatt GH, Oxman AD, Vist GE, Kunz R, Falck-Ytter Y, Alonso-Coello P, Schunemann HJ, Group GW. GRADE: an emerging consensus on rating quality of evidence and strength of recommendations. BMJ 2008; 336: 924-926. Lombardi AV, Berend KR, Adams JB. A short stem solution: through small portals. Orthopedics 2009; 32: 9. Engh CA, Bobyn JD, Glassman AH. Porous-coated hip replacement. The factors governing bone ingrowth, stress shielding, and clinical results. J Bone Joint Surg Br 1987; 69: 45-55. Mortimer ES, Rosenthall L, Paterson I, Bobyn JD. Effect of rotation on periprosthetic bone mineral measurements in a hip phantom. Clin Orthop Relat Res 1996; 269-274. Chen WM, McAuley JP, Engh CA, Hopper RH, Engh CA. Extended slide trochanteric osteotomy for revision total hip arthroplasty. J Bone Joint Surg Am 2000; 82: 1215-1219. Whiteside LA, White SE, McCarthy DS. Effect of neck resection on torsional stability of cementless total hip replacement. Am J Orthop (Belle Mead NJ) 1995; 24: 766-770. Gotze C, Ehrenbrink J, Ehrenbrink H. Is there a bone-preserving bone remodelling in short-stem prosthesis? DEXA analysis with the Nanos total hip arthroplasty. Z Orthop Unfall 2010; 148: 398-405. Hube R, Zaage M, Hein W, Reichel H. Early functional results with the Mayo-hip, a short stem system with metaphyseal-intertrochanteric fixation. Orthopade 2004; 33: 1249-1258. Lacko M, Filip V, Cellar R, Vasko G. Our experience with the metha short hip stem. Acta Chir Orthop Traumatol Cech 2014; 81: 70-76. Romano CL, Romano D, Logoluso N, Meani E. Long-stem versus short-stem preformed antibiotic-loaded cement spacers for two-stage revision of infected total hip arthroplasty. Hip Int 2010; 20: 26-33. Kim YH, Choi Y, Kim JS. Comparison of bone mineral density changes around short, metaphyseal-fitting, and conventional cementless anatomical femoral components. J Arthroplasty 2011; 26: 931-940.
von Roth P, Perka C, Mayr HO, Preininger B, Ziebula F, Matziolis G, Hube R. Reproducibility of femoral offset following short stem and straight stem total hip arthroplasty. Orthopedics 2014; 37: 678-684. McCalden RW, Korczak A, Somerville L, Yuan X, Naudie DD. A randomised trial comparing a short and a standard-length metaphyseal engaging cementless femoral stem using radiostereometric analysis. Bone Joint J 2015; 97: 595-602. Ten Broeke RH, Hendrickx RP, Leffers P, Jutten LM, Geesink RG. Randomised trial comparing bone remodelling around two uncemented stems using modified Gruen zones. Hip Int 2012; 22: 41-49. Tomaszewski W, Kotela I, Kawik L, Bednarenko M, Lorkowski J, Kotela A. Quality of live of patients in the evaluation of outcomes of short stem hip arthroplasty for hip osteoarthritis. Ortop Traumatol Rehabil 2013; 15: 439-457.